Americans aren’t meant to care about soccer, (football to the rest of the world), and for me that presented a bonus in moving here. I have lived a life of blissful ignorance of most things football. Unlike virtually every English male I know, I fail to get excited by how Manchester United, Chelsea or some other billionaire’s plaything are faring in the Premier League. When asked which team I support I instinctively reply ‘Arsenal’ – mostly because it was popular with my friends in the 1980’s. But any follow-up questions leave me stumped. I have only the vaguest idea of how the team is doing and who plays for them. I feel my eyelids becoming heavy when questions arise about key players, injuries, tactics, or virtually any detail that even a lukewarm follower of the Gunners should know. Over the years I have spent endless hours in bars having accompanied friends to watch games, only to find them absorbed in the match while I am equally enraptured in willing the clock to move quicker towards full time. Thus it was with a certain degree or relief that I anticipated coming to live in the States – a land that seemed to share my indifference to the game worshipped just about everywhere else in the world. No longer would I have to feign familiarity or interest in the ups and downs of teams at national and international level. My foreign stature also relieved me of any required knowledge of baseball, basketball, or American football. Or so I thought. It turns out that the US is a land which is slowly gaining the soccer bug. 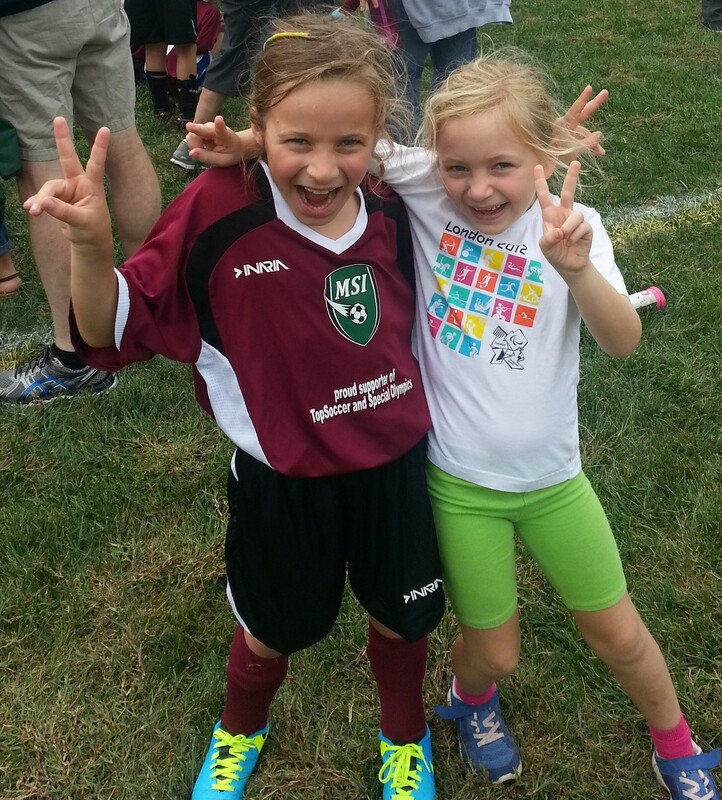 Livvy (shown in post-match victory pose with her number 1 fan – Edie) is one of hundreds of girls and boys who play on a local field every Saturday, in the local children’s league. Her team – the ‘Maroon 13’s’ take the game seriously, with mid-week practices, and end of season medals. And while soccer may be a foreign import, the kids are overwhelmingly as American as apple pie – as are the coaches. I approach Maroon 13’s games with big dollop of fatherly pride and also a fair degree of trepidation – not I might add in anticipation of my daughter’s performance on the field – particularly as she exhibits skill on the pitch clearly not inherited from either of her parents. My nervousness is rooted in being uncovered as a soccer ignoramus. I live in particular fear of one of the other Dad’s whose daughter is the lynchpin of Maroon 13’s defense. 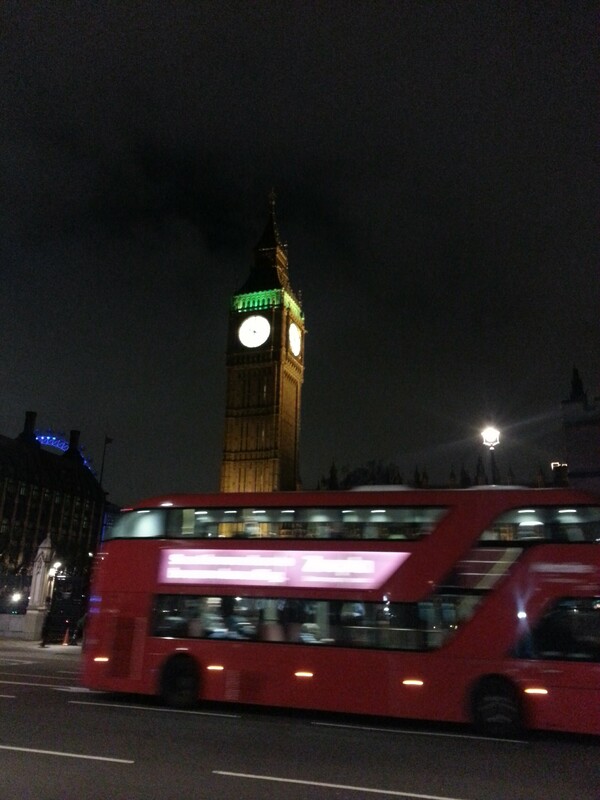 He is an avid Arsenal fan despite having been born and raised 3,000 miles from the Holloway Road. The presence of a fellow ‘Gunner’ (at least that what he thinks) is an opportunity for him to discuss the minutiae of the team’s performance. As a result I spend the Saturday morning matches dodging him along the touchline, desperate to find myself wherever he isn’t, so that I don’t get caught in a chat about which I know nothing. The World Cup is only adding to my discomfort. Earlier today, two workmen – both DC natives – came to my office to put up some wall fittings. Alongside repairing my poor attempt at DIY, they were eager to discuss England’s chances in the competition. Given that I don’t even know my Group A from my Group H, and wouldn’t be able to pick out the England players (except Rooney) in a line-up, we had a stilted conversation that I kept trying to steer back to where my global map and white-boards should hang. The only football quote I know (and which I use if caught in a tight corner when discussing the game), is that attributed to Bill Shankly who said, ‘some people believe football is a matter of life and death…. I can assure you it is much, much more important than that.’ The game certainly inspires near-religious devotion in England, Europe, Latin America, and much of the rest of the world. And while the US could once be relied upon to be once agnostic about soccer, it now seems it is becoming being slowly drawn into the floodlit sacrament of turf, ball and studded boots. And given the growing fervor of Livvy and latterly Edie in football, it looks like I might have to ‘up my game’ just to keep up. Are you too feigning interest in football? If not – how do I start developing an interest? Advice urgently required! Recently a friend’s father died. ‘Suzanne’ as I will call her, decided that she would sit shiva for one night at her home. Many friends attended – not having been able to accompany Suzanne to the funeral which was held in her father’s hometown a few hours away. Nothing strange about that you might think – except that Suzanne is a Quaker, as was her father. Suzanne’s husband ‘Jeff’ is Jewish, and as such they have, over the years, taken their kids to a local Reform synagogue. Their family life is a fusion of faiths with Christmas Tree and Chanuka lights at winter-time. But it was Suzanne – not her husband – who became involved in the synagogue through her children’s attendance at its Hebrew school, to the point where she was running the parent teacher association. Coming to the States from Israel, and before that the UK, this kind of seamless religious integration between Judaism and other faiths, was completely foreign. But I am now coming to understand the peculiarities and positives about Jewish life in the US. When Lysette and I first arrived in the Washington area from Tel Aviv, we felt nervous about re-entering life in the ‘Diaspora’. In Israel, we identified in our family life as hilonim (‘secularites’), meaning in practice, we kept Kosher at home, did Kiddush on Friday night, went on hikes or socialized on Shabbat, and virtually never ventured to our local orthodox synagogue (there was no other brand of Judaism around). But our kids spoke Hebrew fluently, learning about the meaning and traditions of Jewish life in their supposedly secular kindergarten and school. In our own way we also celebrated the festivals including, putting up our Sukkah in autumn (like most of our secular neighbours), lighting the Chanukah candles in winter, holding a seder night at Passover. The Holy Days were the national holidays, making synagogue feel unnecessary in this all pervasive (and positive) Jewish and Israeli atmosphere. I recall one occasion when close family came to visit us from England. ‘Do you like going to shul’, my cousin’s husband asked my daughter, Livvy, then aged six. Her face reflected back puzzlement by way of response. ‘Bet Knesset’ I said, using the Hebrew rather than Yiddish word for synagogue. ‘But we don’t believe in Elohim (God)’ Livvy retorted. I don’t recall articulating my atheism, but it had obviously been picked up from the way we led our lives and the difference between us and the dati’im (religious), who Livvy observed attending synagogue. When we got to the States, we realized that this situation wasn’t going to hold if we were to invest our children with a strong and positive Jewish identity. On our first Yom Kippur in Washington, a short while after arriving, we drove to a local synagogue about which we had heard good things. In Israel, the Day of Atonement consisted of Livvy and Edie cycling around the streets, which were for this one day in the year, completely free of cars. Instead the roads were packed with the bikes, pedal scooters, and skateboards of those who weren’t in synagogue, but who wanted to take advantage of the lack of traffic and pollution. In Washington, en-route to the synagogue for our first family Diaspora Yom Kippur, Edie glanced at the car alongside ours which had bikes stacked on a rack in the rear and declared, “look, they must be Jewish too”. For her, and for all our family, being Jewish had come to mean doing the same as the people around us. Thus began our journey in the US through the differing strands of Judaism in our vicinity; including Conservative, Modern Orthodox, Reconstructionist, Reform and more. We ultimately settled on a relaxed Liberal Conservative synagogue, with the girls attending, in addition to regular school, an Israeli-style pluralistic Hebrew school. Jewish life here on the East coast of the US is very different from how I remember it growing up in London. As a child you instinctively dropped your voice in public when uttering the word ‘Jewish’, and the general tenor was that this was something to keep low-profile and private; British on the outside, but Jewish within. In the US, being Jewish is part of the vernacular, a variation upon a theme, like I imagine Catholicism to be in the UK. I feel constantly surprised by how much Jewish culture has become part of American life. Yiddish phrases effortlessly pop out of the mouths of non-Jewish celebrities on TV, the papers are filled with matza related recipes around Passover, while at the same time of year President Obama holds a Seder at the White House. I was brought up to believe that being Jewish wasn’t easy and was meant to be far from effortless – a bit like digesting gefilte fish. The local synagogue I attended as a child was traditional and cold, both in temperature and practice, with the officials (all men) attired in suits and shiny top hats. In Israel, the Orthodox was the synagogue we didn’t go to. But America is a country built upon the notions of freedom, choice, and convenience. And that has come to mean endless selection in all aspects of life; from breakfast cereals to the kind of Judaism you feel like practicing. The end result is seductive and inviting. 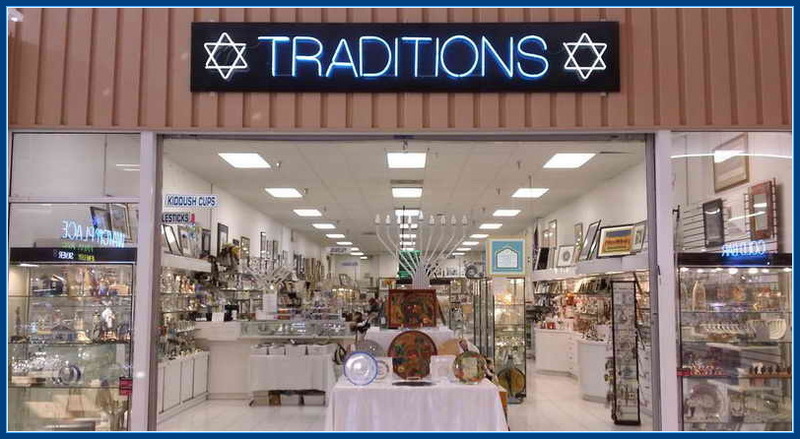 This has meant – in the American context – taking Judaism out of its particularistic closet, and making it seemingly more universal and accessible within society as a whole. It has become (mostly) synonymous with liberal values, acceptance, and openness. The synagogues are warm, comfortable, places with welcoming people on hand to guide you through the range of services – religious and social – on offer. This is all very strange to me, schooled in the private nervousness of Anglo Jewry and the public assertiveness of Israel secularism. But then this is the New World, which while foreign, also offers something novel, curious and maybe ultimately – homely. Spring as we all know is the time for new buds of life to break forth, for color to fill what was barren and for the sun to emerge from behind the clouds. It is in that spirit that the ‘Foreigndaze’ blog is launched. After a very long hibernation, I have decided to add some personal colour to the internet with observations on aspects of life – mainly in the United States – but also from elsewhere, running the gauntlet from food, the American flag, tales from my travels and more. 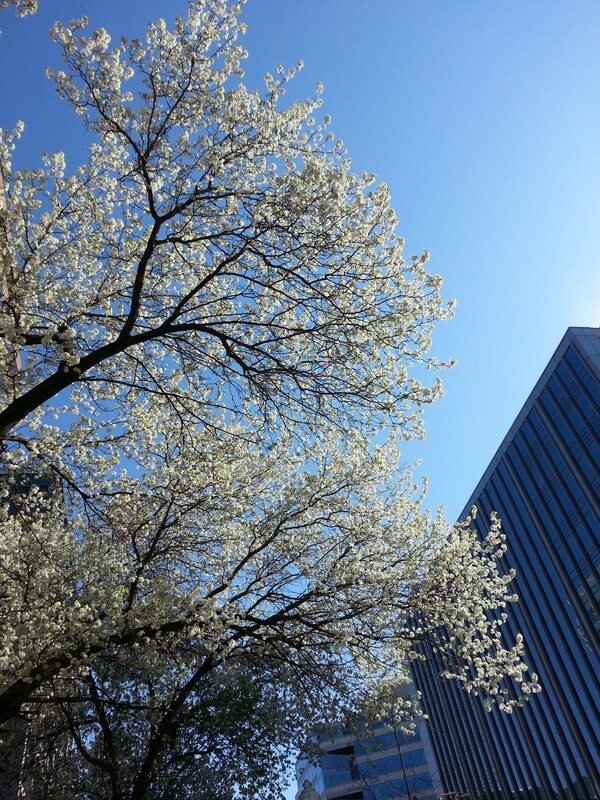 But this first submission begins on a seasonal note to mark the bursting forth of blossom from every corner of DC. After months of winter which featured periodic deluges of snow, ice and rain, the city is letting out a collective happy sigh with the sudden flowerings and warmth. And in the USA nature undertakes this seasonal shift with an explosion of activity full of specatacle which leaves the UK, figuratively and literally – in the shade. Blossom blown from the trees fills up gutters with multi-coloured leaves. Beatrix Potter like scenes with bouncing rabbits and scrambling squirrels are played out in suburban gardens bursting with new plants and flowers. Having grown up in a country which would comfortably fit into a medium size American state, most things in the US appear (and are) bigger: the cars, the shops, the people, the food, and also…the weather. Where in England there is a breeze which ruffles leaves, here gales gust and blow, felling thick old trees with apparent ease. British seasons arrive in national character, somewhat meekly and apologetic in manner as if having stepped in quietly through a side entrance. In Washington they barge in through the front door with a brazen call to attention. Spring – as already mentioned – is a riot of activity and color, as if the forces of nature had just knocked back one espresso too many. Once the hyperacitivity of this season has passed, the DC summer arrives with a sodden knock-out blow of humidity accompanied by lush vegetation and a blazing sun. Autumn (aka fall) is a leafy carnival of crunchy leaves: fiery reds, pale yellows, translucent oranges, sandy browns, filling up the gardens and streets to knee level. It suddently gives way to a barren winter-scape of naked grey trees,overcast skies, and teeth chattering temperatures. A country’s climate is in many ways a weather vane (pun intended) of its national character, or the other way around. Before coming to Washington we lived in Israel where heat (with very little cold) came in differing gradations depending upon the time of year , ranging from gently warming to ‘singe your eyelashes’ hot. This bears a striking resemblance to the temperament of Israelis who lack any sort of moderating temperature control for their emotions. Similarly the UK exists under near permanent cloud-cover where reports of good weather and more often that not dashed by capricious rainstorms. Similarly British people often seem quietly downcast, waiting with resignation for what life or the elements will bring. By contrast, the American climate demands attention, and not just to the weather forecasts which warn of yet another impending snow storm or heat wave. The seasonal variations require considerable hard work, cleaning up the detritus of the past season and preparing the ground for what’s coming next. Our neighbourhood is a hive of activity with people trimming, sweeping, cutting, and planting. I am currently nursing blisters and scratches having joined in the communal clean-up, hav ing filled seven large brown paper sacks with leaves, twigs, weeds and much else. This fervent activity also seems descriptive of the American character, which places high values industriousness in every aspect of life. Despite the periodic harshness of the climate, people here seem to pitch themselves against the forces of nature with an energetic optimism. Americans seem to relish clearing masses of vegetation when most Europeans would be happily sitting back with a long, cold beer. There is much to admire in the power of nature in the US. It packs a punch even when it is ‘regular weather’. On extreme end of the scale it is humbling and scary. During ‘tornado season’ in the Mid-West, the news regularly reports of communities reduced to matchwood, with tearful residents pledging to rebuild their lives as soon as possible. Americans have both shaped their environment and been shaped by it. This is very place different from William Blake’s ‘green and pleasant’ England. It is a tougher, harder country which has historically has brought a lot of privation en-route to the land of plenty it has become today. The weather brings home the fact that this is a very different landscape from Europe and certainly from the Middle East. And what is true for the climate is representative of so many other aspects of life: politics, social attitudes and much more. All of which I hope will provide a steady stream of material for future (regular) instalments of this blog.